My two favorite black stamp pads are VersaFine Pigment Ink for Fine Details and Memento Fade-Resistant Dye Ink. I use both on a daily basis, depending on my project. If you're trying to decide on a stamp pad, check out my comparison below! Dark, solid ink coverage on almost all surfaces, including matte paper, card stock, watercolor paper, muslin bags, and more. Works great for detailed and "inverted" designs (solid shapes that have text or designs subtracted from them). Slightly sticky - you have to be a little more careful using this pad. Ink may be harder to get off if you don't clean your stamp after each use. A great everyday stamp pad. Best for smooth, matte paper and card stock. I use this pad for stamping shipping labels. Firm pad makes for a quick and neat process. Easily washes off clear photopolymer and rubber stamps. Ink will bleed on porous surfaces like fabric and wood. Notice the solid vs. textured appearance? Both are great - just depends on what you want! The texture of the paper comes through even more with Memento ink in this example. VersaFine tends to fill those tiny cracks more...making for a darker, more precise impression. When it comes to stamping something super textured like a muslin bag, VersaFine is my fave. You really can't beat that impression! Want more stamping supply tips? Check out My Favorite Stamping Supplies. 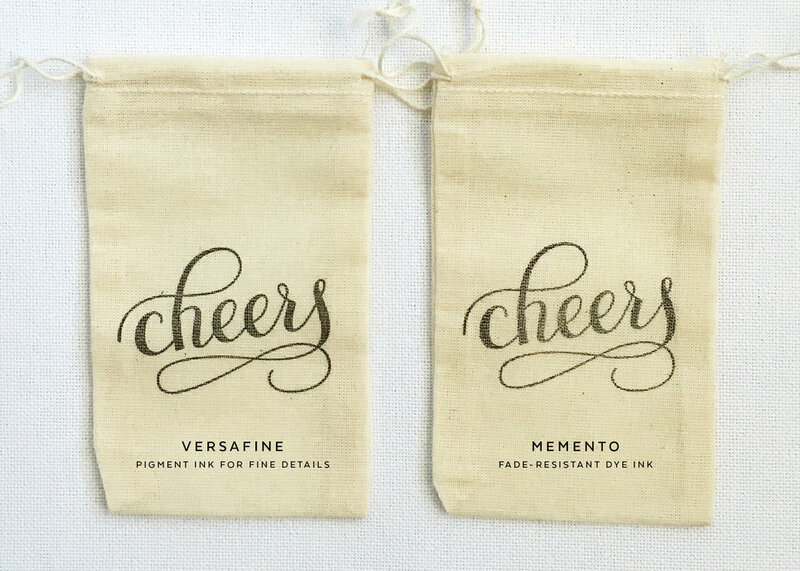 Want to buy our Hand-Lettered Cheers stamp? Shop here.